The Arch of Claudius was a triumphal arch built in honour of the emperor Claudius's successful invasion of Britain. 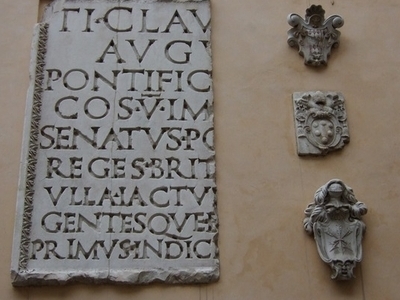 It is now lost, although its inscription is held at the Capitoline Museums and may be seen here. The arch was dedicated in AD 51, although it was anticipated on the reverse of coins issued in AD 46-47 and AD 49. The coin shows it as surmounted by an equestrian statue between two trophies. It was a conversion of one of the arches of the Aqua Virgo aqueduct where it crossed the Via Flaminia, the main road to the north, just north of the Saepta. It seems to have been in ruins as early as the eighth century, but in 1562, in 1641, and again in 1869 portions of the structure were found, including part of the principal inscription, inscriptions dedicated to other members of the imperial family, some of the foundations, and fragments of sculpture of which all traces have been lost. Here's the our members favorite photos of "Monuments in Rome". 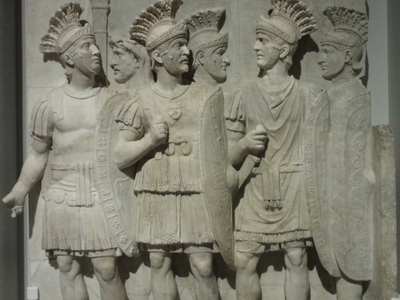 Upload your photo of Arch of Claudius!